We traveled to Wisconsin for Thanksgiving this past week to celebrate with my family. This year we gathered at my oldest brother's home. It was the first time my mother did not host and therefore first time in many years that she did not have to do everything. Three generations of us gathered around two tables (and in one baby jumpy thing) to eat, talk, and catch up. The past two years have been a bit rocky for us all, and it was nice to simply be together. Dessert even brought in my father and his wife to round us out. Odds had it that a few were missing and missed, but we carried on. Since my mother wasn't running about like mad trying to make pies, mashed potatoes, stuff the turkey, remember the pickles from the basement, find the inserts for the dining room table, and sort out appetizers she and I had time to sit down and talk. I asked about her past traditions (they always had goose or duck - never turkey), the garden at the farm (they had one by the marsh and one by the woods), and dishes her mother used to make. The last one is where we really got down to it. She pulled out two old cookbooks that were my grandmothers. 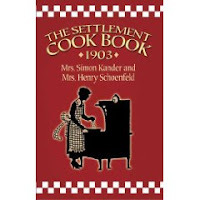 One was The Settlement Cookbook, 1951, compiled by Mrs. Simon Kander. The title page states that these are "tested recipes from The Milwaukee Public School Kitchens Girls Trades and Technical High School, Authoritative Dieticians and Experienced Housewives." This is apparently the thirtieth edition, enlarged and revised. The first came out in 1901. My grandmother's handwriting is peppered throughout making notes on what she added, increased, or left out. Recipes she tried and liked got a nice x next to them, and the inside cover is littered with notes of full meals. I spent about an hour or so simply paging through and letting it all wash over me. I was immediately transported back to the kitchen at Cold Spring Farm, and tried to imagine what it was like with my grandmother there cooking and feeding the crews that came to work. My mother says the farm had a reputation for good food, and I believe it based on her notes. The most surprising outcome of all of this is the discovery of a long-lost, much-beloved recipe that my other grandmother made each hunting season. The family believed this recipe to be lost after her death, and at least once a year an inquiry goes out to each household to see if anyone found it after all. I made them Thanksgiving morning and took them to the dinner. I forced my overstuffed family to try them and see if they were indeed the ones. I still feel weepy when I think of their faces and how excited they were to taste them again. Corny as it sounds I felt like both of my grandmothers - one I never knew and one who was like a best friend - were with us again. That was something to celebrate. Chocolate Toffee Bars from The Settlement Cookbook, 1951. Cream butter and sugar until light and fluffy. Add flavoring, well-beaten egg and flour sifted with salt. Stir well. Spread on oblong shallow pan. (I used a cake pan but next time I'm going for a cookie sheet or jelly roll pan.) Bake at 350 for about 25 minutes. Remove from oven, cover with melted chocolate. Sprinkle with nuts. Cut at once into bars. I just happened along your blog after searching google for "hoophouses in michigan". I am always excited to find other great farm related blogs from Michigan! It looks like you have some interesting posts, I'll be stopping back by for sure. I'm going to scan through and see if you have other posts relating to your hoophouse. We're looking into different building options to replace part of our barn that burned. Where did you purchase your hoophouse? Hey Jena, Thanks for reading the blog! I'd be more than glad to share whatever I know about hoophouses. I feel like we're learning all the time, that's for sure. We purchased materials at one of those big box stores we don't usually like to shop at if we can help it. Check out the links in the October 21st bit about hoophouse construction. Hopefully that helps! Let me know how it goes.